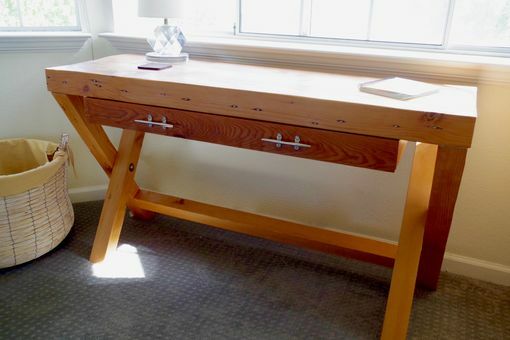 This is a spectacular and substantial desk for a larger space. The desk is made entirely from very thick 3.5in reclaimed Douglas Fir. The Douglas top has been smoothly finished and retains some beautiful nail hole oxidation (black). The drawer has a solid reclaimed Redwood facing and is framed with both reclaimed Douglas Fir and new growth Poplar. The drawer pulls are polished boat cleats.